The rack mounting hardware consists of front and rear adapter brackets with cage nuts, screws, and shelf rails. Select the two front adapter brackets that match your rack. The server ships with two sets of front adapter brackets: one (1) for racks with square holes and one (2) for racks with round holes. Select the adapter brackets that match your rack. Attach the front adapter brackets to the rack. Make sure you orient the adapter brackets correctly, with the arrow pointing up. Select the screws that match your rack. Use one M6 per side for a square-hole rack. 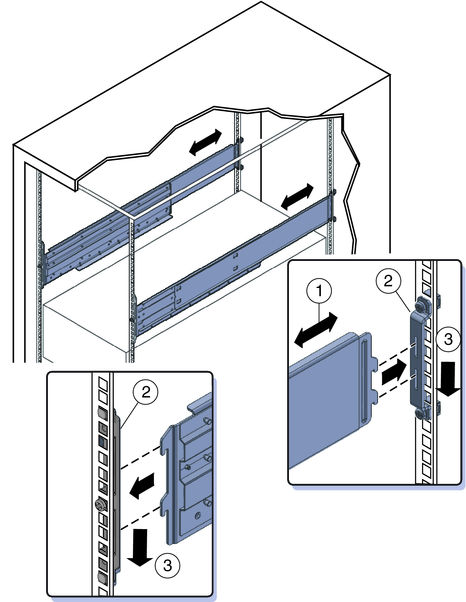 Use three M6 or three 10-32 per side for a threaded round-hole rack. 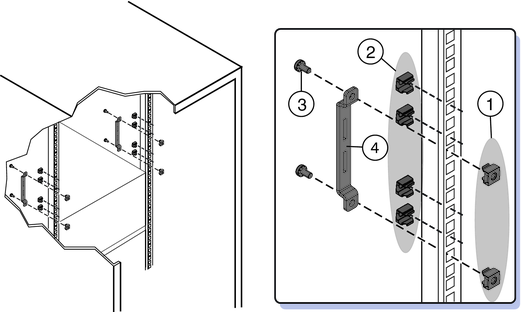 The following figure shows the front adapter brackets being attached to a square-hole rack (1) and a round-hole rack (2). 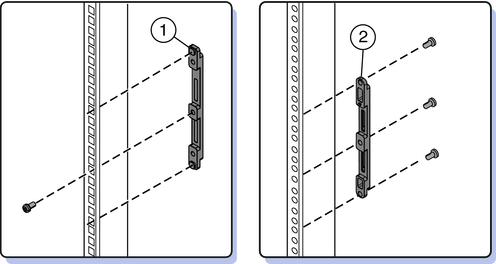 If your rack has round holes, use two screws each (1) to fasten the two rear adapter brackets (2) to the rack. If your rack has square holes, skip this step. The top of the rear bracket should sit 1 RU (three holes) lower than the top of the front bracket. Insert the cage nuts (1) for the rear adapter brackets in the holes on the rack. If you are going to install shipping brackets, insert the cage nuts for the shipping brackets (2) in the holes in the rear of the rack. Note the orientation of the cage nuts for the shipping bracket. They face outside the rack, in the opposite direction of the cage nuts for the adapter brackets. They are located in the first and third holes above the cage nuts for the adapter brackets. 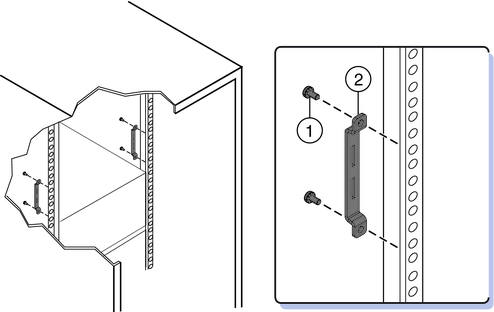 Note - If you are going to install shipping brackets so you can ship your system in a rack, and your system has a square-hole rack, you must install the rear cage nuts for the shipping bracket on the rack now, before installing the rear adapter bracket. You cannot add the cage nuts for the rear shipping bracket when the rear adapter brackets are in place. See Removing and Installing the Standard Rack Mounting Kit Shipping Brackets for instructions to install the shipping brackets. Use two screws (3) to fasten each rear adapter bracket (4) to the rack. The following figure shows a square-hole rack. Be certain to place the shelf rails in the proper orientation, with the shelf facing inward and the gap towards the front of the rack.